The Alberta government is looking to table a bill that allows transit-only and HOV lanes for provincial highways, with Deerfoot Trail (Hwy 2), Stony Trail (Hwy 201), Anthony Henday Drive (Hwy 216) and Hwy 63 (between Fort McMurray and the oilsands plants) as the main candidates. Currently HOV lanes were only allowed on municipally controlled routes, such as 9 Ave SE and Centre Street in Calgary. The use of the word "table" confused me at first. In U.S. legislative parlance, "table" usually means "kill" (or at least postpone indefinitely). In Canada, does it mean "put on the table" for further discussion? To table a bill in Canadian constitutional practice is to bring the bill up for debate and discussion in the legislature by the government of the day. I didn't know that "table" essentially meant the opposite in U.S. legislative parlance to Canada, good to know. The Canadian phrase comes from an old tradition in the British Parliament which involved an actual table. The opposite American phrase also came about literally placing a bill to be killed on a specified table. Southeast Stoney Trail (Highway 201) around Calgary opened to traffic today. That's 25 km of six-lane freeway. (they used the wrong week in the press release, they state it opened Friday 15 November, but it's Friday 22 November, perhaps they'll correct this). Back to Calgary I go, I suppose. I have been following the construction of both Calgary's and Edmonton's ring roads for the past little while. While it is undoubtably great for both cities, in terms of freeway design, both 201 and 216 look pretty vanilla. Only the Deerfood and maybe Glenmore Trail in Calgary look like they'd be any fun to drive. Some of the roads through the foothills look promising though. I found the Crowchild and Sarce Trails fun to drive in Calgary. The Glenmore Trail and 16th Ave were both to crowded and packed with traffic for my taste. Sarcee Trail SW, Shaganappi Trail, and 14 St NW offer some good views of the city. Glenmore can be busy, but during off periods it's not too bad, hopefully the city widens it to 6 lanes west of Crowchild Trail soon. Only if you're really into boredom. The only thing that keeps AB 35 from being the most boring highway ever is that, if you're lucky, you'll see a train on its way to or from Hay River NWT. Far from. I thoroughly enjoyed my trip up to, through, and down from NWT. I'm not bored by a landscape that vastly different than my own. Now, having to drive more than two days through the outback, that did become boring. The third bridge across the Athabasca River in Fort McMurray opened to traffic recently. The bridge has been expanded to 10 lanes. This would also make it Canada's northernmost freeway. I assume the unusual layout in that last picture is because it was originally one bridge and the others have been added piecemeal. Quite why such a remote outpost needs a collector distributor system is beyond me when there are plenty of busier crossings that are crying out for such a luxury. The far left bridge, from Google Maps, is a truss bridge. I'm guessing that was the first bridge here. The middle one is the second bridge, added later when the road was divided. The third one is the new one. My guess is that the setup is because of the need to have both freeway and local traffic crossing the only bridge in the area. Fort McMurray has a bit of an interesting layout that result in major traffic issues. There's only one highway (Hwy 63) that goes south and connects Fort McMurray to the rest of the world; it's central business area is located south of the Athabasca River while the majority if its residential area and the Oilsands plants (main employment area) are located north of the river. With Oilsands plant development, there are a lot of oversized loads that come from the south going north where police have to close traffic and they preveously used the middle bridge. There are a lot of non-resident workers to there is a lot more traffic than it's population would indicate. A friend of mine used to work & live in Fort McMurrey. He told me that there were stores that were located on the north side of the river that were charging more than the southside stores simply because of the convenience of not fighting traffic on Hwy 63. 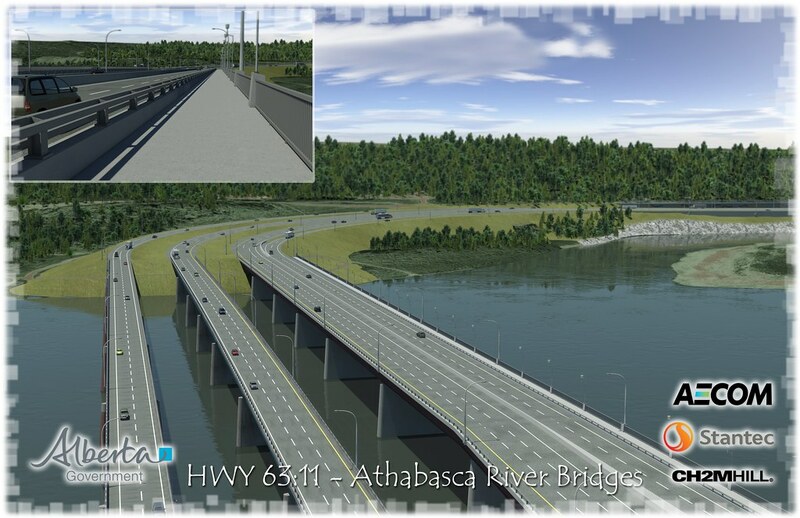 According to Alberta Transportation, the AADT on the Highway 63 bridge is 60,000 vehicles per day. That's quite high for such a remote place where all traffic is generated in the local area. The AADT further south is only 2,500 - 5,000 vpd (these parts are being twinned). 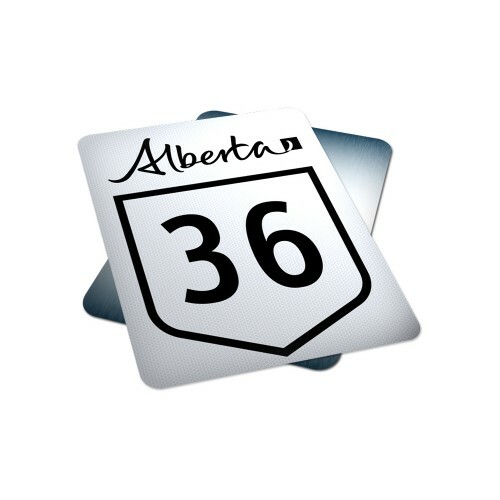 Alberta has revised its highway shields to reflect its logo that was updated a couple years ago. Some of the shields are starting to show up in the Calgary region. I'm usually pretty open to new sign/shield designs. But this... meh. It's not godawful (but I'm sure most of this board thinks it is), but it's not impressive. My biggest gripe is that the stylized Alberta signature is pretty much unreadable from a moving car. My second gripe is that the numerals are too small. For some reasons, while I don't have issues with Clearview numerals in legends, I do think it looks funky on a shield. It's not because it's the first time I see it; Ottawa and Winnipeg use it on their municipal road shields. The older Alberta legend looks pretty dated though, compared to the new stylized version. There was a period of old legend with Clearview, not reflected below. I saw it in the field last year.